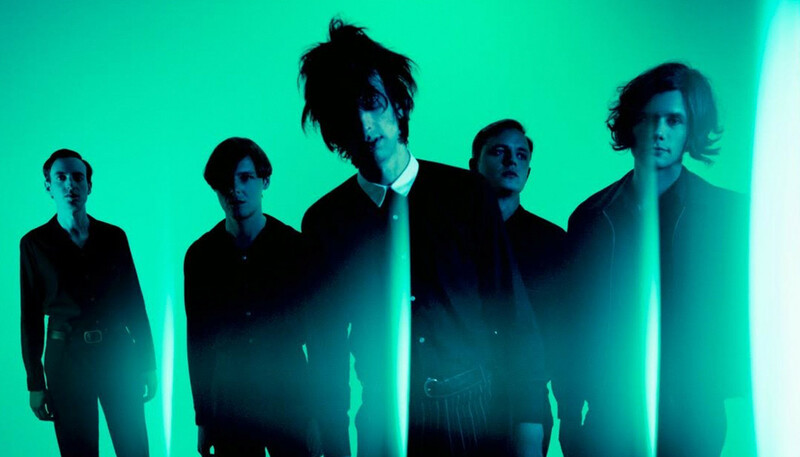 A full decade on from their debut, The Horrors are still thriving and are as intent on pushing boundaries as ever. We caught up with bassist Rhys Webb to hear the story behind their aptly-titled fifth LP, V, and to talk gruesome artwork, longevity and the secret to balancing critical acclaim with mainstream success. We’ve seen your new album, V, being billed as a risk. How so? Well, I think it’s a risk to feel like you are excited about trying to explore sounds, and the risk is that perhaps people might prefer it if you didn’t, I guess. But as a band we’ve always wanted to explore and experiment with new sounds and new ideas, so that’s crucial to us being a group. It’s what motivates us. Do you anticipate fans being taken aback? I don’t know about taken aback; it sounds a bit too dramatic. I actually hope that people are going to enjoy it. It’s just about a need for us to challenge ourselves as a band creatively, and sometimes that means exploring new sounds. I think a lot of bands possibly don’t take that risk, and they stick to a certain formula, but for us that’s not a particularly exciting prospect. For us, experimentation is just a very essential and natural part of the journey. It’s just about pushing for other ideas, rather than a complete reinvention. So I don’t think people will be taken aback because actually – even though, with this album in particular, we wanted to work in a different way –I always think it sounds like The Horrors. It doesn’t matter what we’re doing; if it’s an electronic track or a fast, guitar-led number, I think it always ultimately sounds like us. We might have been one of the last bands that really encouraged their fans to have an identity. You mentioned that you worked in a different way. What did you do differently? When we started it was just about playing loud music, and feeding off an energy; a raw power attack of music. But by the time we got to the second record the band started to evolve and to become the band that we are now. Every individual started to explore their instrument, and creatively it was a very different picture, which has been a continuing journey. So we did that and it was great, but it got to the point where it felt like it had to change a little bit. For one, we’d never worked in a studio with a producer in a creative way; we’ve always written and recorded or demoed the songs and had the arrangements down ourselves. And there’s never been any A&R people coming down to the studio, listening to music; we’ve just been left to our own devices. So it felt like we needed a little bit of waking up; a bit of reinvigoration after 10 years of being in the band. And it felt like a fresh challenge would be to work creatively with someone else, so that brought a great new energy and spontaneity and enthusiasm for us all being in the studio. Why did you choose Paul Epworth as your collaborator? Well, we’ve always had a loose connection to him. For all the bands living in London in the early 2000s, he was quite an ever-present name. He was working with bands like Bloc Party, and doing the Phones remixes, and sound for The Rapture. And he was working at 93 Feet East which had people like Andrew Weatherall playing techno, and loads of great gigs. So he’s always been a name we’re aware of. And I think for us, we were keen to bring someone in who had their own ideas of songwriting and, of course, he had worked with Adele. And he’d also built this amazing studio. We just thought it would be more of a challenge to put ourselves in a situation we weren’t 100% comfortable with and see what happens. We had to do a test run, so we just got together and did a two-week session at Church Studios. Faris [Badwan, lead singer] and I went down to meet him and he said, “Working with you guys sounds like loads of fun,” because he was itching to do something that would get his creative juices flowing, working with a band who he knew he could go crazy with. When we walked in he’d set up a wall of synthesizers that he’d been collecting over the years. We went in with a load of demos and he said, “Look, why don’t we start doing something new?” So we just started writing with him in that first session, and every day we worked on new songs, some of which made it onto the album in various forms. Could you tell us about Faris’ lyrical approach for this record? Our general feeling was that it’s our fifth album, we’re 10 years down the line and we really just want to put everything into this album. It felt like certain elements that drove us initially weren’t as present, and I don’t know if that’s just playing together for so long. But one of the things we really wanted to do was just make every aspect of the album feel passionate, really. So I can happily say this album is, for Faris, a lot more personal than perhaps some of the recent stuff. I mean, he doesn’t even really like talking about lyrics, but for him it’s an idea that a lot of things he speaks about are very personal, from personal experience, personal relationships and situations. But he likes to present them in an abstract form , and also with contradictions there for people to be able to tell their own story and appreciate the lyrics in their own way. For this album, we really wanted to give it our all and I think as a result there was more honest and personal content from Faris. The thing is, though, there are always abstractions. The lead track, ‘Hologram’, is actually about the conspiracy theory that the universe is a projected hologram. So there’s all sorts of things going on there. The artwork for the album is arresting. Can you tell us about it? It’s by Erik Ferguson. We wanted to do something new and exciting and bold with the artwork; for it to be in some way subversive and somehow quite gruesome and a little bit uneasy to the eye immediately. One of the challenges was how comfortable we were with the artwork. And it wasn’t so much the fleshy, grotesque, or even sexual, element – it was just some of the composition of it itself. We liked the idea of working in CGI, and wanted to do something that was computer-generated and had a futuristic, even kind-of sci fi feeling to it. So we had our heads 3D scanned, and [the artwork ] is essentially the five of us represented as this five-headed monster, which is kind of what the band is because there are five individuals that push and pull with their own personalities. A decade on from your debut, you occupy a unique position, being a band that niche music publications will write about, but also receives coverage in The Sun. How do you find it straddling those two worlds? I mean, we have always been ambitious in our attack of what we want to do as a band. Our real motivations and inspirations probably do come from the underground, but we appreciate great pop music, from the birth of pop in the late 40s through the 50s to now. For us, what’s really important is writing a good song, essentially, and being able to have the freedom to be adventurous or abstract in the way we communicate it. So our aim is to try to write great songs and also have the freedom to be weird with it, or to experiment in the way we want to do. And if that idea crosses over then great, we want people to hear it and have a good time listening to it. I don’t think any music really should be put in a particular box, only to be shared in an underground paper or a fanzine or a cool blog, or to be written about in a red top or a Sunday supplement. We’re happy to be able to put our music out there in different ways. Most of your peers from the early days have either split up or changed their line-up. What’s the secret staying together? I feel like when we started the band we were not motivated by anything that was going on, particularly in our contemporary world of music. I feel like we’ve always kind-of created our own world and there are definitely points where that’s really crossed over but essentially we’ve not really been a part – or wanted to be a part – of any particular scene or movement that was happening at that time. As a result we’ve always enjoyed what we’re doing. And everyone gets on well. There are obviously disagreements and arguments but there are no big problems. It’s true, though: lots of the groups we played with at the beginning don’t exist anymore. And, actually, I don’t know how relevant some of those bands would be now. Personally, I didn’t want to listen to half of them at the time anyway, so I definitely wouldn’t want to listen to them now. (Laughs) I hope there’s just a bit of longevity to what we’re creating. An interview with iD in 2007, Faris said that he wanted The Horrors to be “an institution like The Ramones or The Velvet Underground.” Is that still the ultimate goal? I would say yes. I don’t know how that would work in this climate for music... But I would absolutely love for that to be the case. I mean, when we started The Cramps were a big inspiration because they always did exactly what they wanted to do, looked the way they wanted to look, and had their own scene. I was actually talking about this the other day. Although it wouldn’t make any sense for us to be in polka dots, eyeliner and whatever we wore at the time anymore, I kind of feel like we might have been one of the last bands that really encouraged their fans to have an identity, turning up in the gear with crazy hair styles, and Siouxsie and the Banshees-style eyeliner, mixed with anything else you could find. I don’t think that’s really happened in rock’n’roll since, which is quite an achievement.